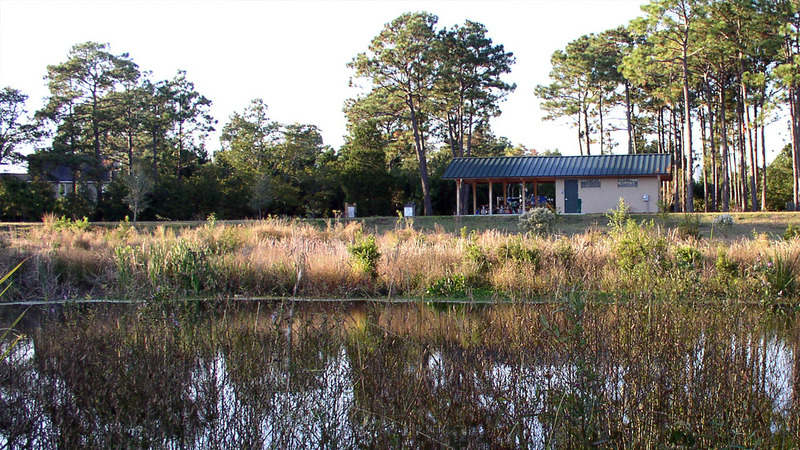 Provide a picnic shelter for a natural park adjacent to a stormwater wetland. The park plan was developed by HadenStanziale, and locates the vehicle parking, playground and picnic shelter near the park entrance, preserving most of the 17-acre park for trails and passive activity. The12-acre wetland captures stormwater from the Hewlett’s Creek Watershed and removes pollutants before it continues to the waterway. To help unify the appearance of its parks, the City chose to utilize a shelter similar to the one our firm designed for Halyburton Park. In addition to providing the new picnic shelter, our design included repairs to existing structures.